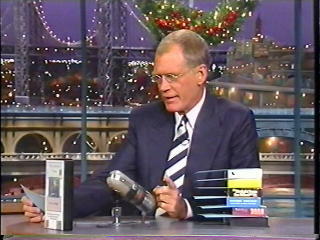 One of Karen’s videos (Cave Cooking 1) was featured on the David Letterman show on 12/21/99! As part of the "Dave’s Video Collection", Dave showed Karen eating grubs and this is what happened…. "Now remember folks… Wait for the humorous comment"
"This is a guide to eating well in the Wilds"
They then showed video of Karen eating some grubs and listened to her comment on the taste. The audience screamed and ooohed as Karen played her part. 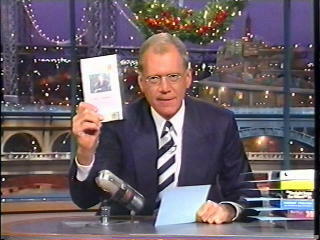 "After Y2K you people will be BEGGING for this tape! Begging… please folks give us the Tape!" And ya know what? They did. We were flooded with calls the next few days. Several of Dave’s crew actually ordered the entire series!